KISE FUSEI was born on May 4, 1935. He began his study of karate in 1947 under his uncle, Master Makabe. In 1955, Master Kise became a student to Master Shingake Nobutake and received his shodan. In 1958, Master Kise began studying under Grandmaster Soken Hohan, the third successor of Matsumura Seito Shorin-Ryu karate-do. In 1960, he was a student of Grandmaster Nakamura Shigeru, founder of the Okinawan Kenpo Karate-Do Federation, and qualified for his 7th degree black belt. After five years of training, Master Kise became a shihan (“master”)on January 1, 1965, when he passed the 7th dan examination under Grandmaster Nakamura. At that time, Master Kise taught and practiced Shorinji-ryu karate-do. During this time, he continued studying Shorin-ryu under Grandmaster Soken. On January 1, 1957, Master Kise switched completely over to Matsumura Seito Shorin-ryu. On January 3, 1972, Master Kise qualified for the hanshi title by passing the 8th dan examination held by Grandmaster Soken and Master Makabe. Sep 1st 1976 Master Kise qualified for his 9th Dan by Grand Master Hohan Soken. In 1977 Master Kise founded the Shorin Ryu Karate Kenshin Kan Karate and Kobudo Federation. 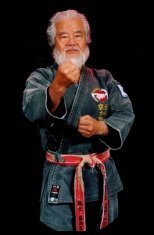 On Oct 25 1987 Master Kise was promoted to 10th Dan by Master Shigaru Tamaiya. In 2001 the Government of Japan gave there Seal of Approval to the accuracy of Master Kise’s book. They have stated that he (Grand Master Kise ) is the sole true heir to Matsumora Orthodox Karate, being passed down to him from Hohan Sensei. This has been entered into the official Government Archives. This means there can be no more disputing the Lineage of Matsumura Orthodox Karate. It belongs to our Grand Master Kise. 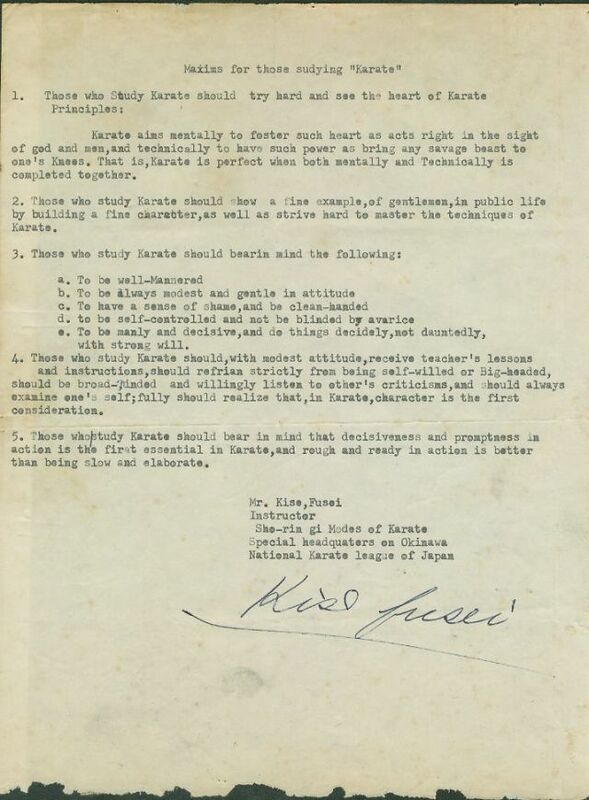 Master Kise’s Maxims for those studying “Karate.